Pedro Nel Gómez Agudelo (4 July 1889 — 6 June 1984) was a Colombian engineer, painter, and sculptor, best known for his work as a muralist, and for starting, along with Santiago Martinez Delgado, the Colombian Muralist Movement, inspired by the Mexican movement that drew on nationalistic, social, and political messages as subjects. One of Colombia's most prolific and prominent artists of his time, Gómez created 2,200 square meters of fresco murals in public buildings. Pedro Nel was born on 4 July 1889 in Anorí, Antioquia, to Jesús Gómez González and María Luisa Agudelo Garcés. He attended the Academia de Bellas Artes de Medellín, where he completed his secondary studies in 1917, he then attended College of Mines of Medellín where he graduated in Civil Engineering in 1922. In 1925 he travels to Europe and settles in Florence, Italy, where he attended the Accademia di Belle Arti di Firenze. While in Italy he meets his future wife, and mother of his eight children, the Florentine Giuliana Scalaberni. 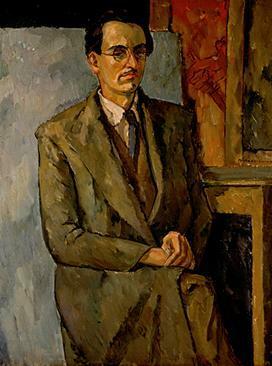 In 1930 he returns to Colombia, and becomes Director and professor of the Academia de Bellas Artes de Medellín. ^ a b c d Escobar Calle, Miguel. "Pedro Nel Gómez: Cronología de un Período". Universidad de Antioquia. Retrieved 19 August 2013. Bedoya de Flórez, Fabiola; Estrada Betancur, David Fernando (2003). Pedro Nel Gómez: Muralista (in Spanish). Medellín, ANT: Editorial Universidad de Antioquia. Arango Gómez, Diego León; Fernández Uribe, Carlos Arturo (2006). Pedro Nel Gómez: Acuarelista (in Spanish). Medellín, ANT: Editorial Universidad de Antioquia. Arango Gómez, Diego León; Fernández Uribe, Carlos Arturo (2007). Pedro Nel Gómez: Escultor (in Spanish). Medellín, ANT: Editorial Universidad de Antioquia.